Westminster Teak's Barbuda Collection features premium, high end, quality round and rectangular folding "Drop Leaf" tables for indoor, outdoor, residential, commercial or marine use. Lifetime Warranty. Built to withstand harsh conditions for 75 years, untreated. Round and Rectangular Folding and Drop Leaf Teak Tables for All Weather use indoors or on patios. Built to last a lifetime. All of our Teak Outdoor Furniture, including our folding teak tables, come finely sanded to an irresistibly smooth finish. Although no treatments or coatings are necessary to extend our teak furniture's longevity, we do offer treatment options such as teak oil, teak protector (to prevent stains), teak shield (to maintain the new color), and our high gloss, Yacht Marine Finish. All options except the high gloss yacht finish are selected when you add each item to your cart. For the Yacht Marine Finish inquires and quotes, please contact us. My order arrived in great condition. 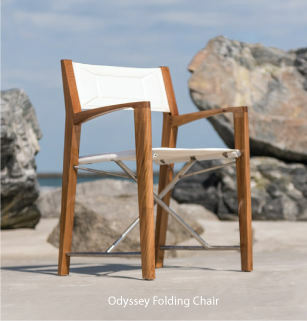 I really like the teak folding table and teak folding chairs. I am so very pleased with my new Barbuda Folding Table which arrived in perfect condition just 3 days after I ordered it! The shipping crate was nothing short of amazing! If only all furniture was shipped this way! I actually had to go out and purchase a pry bar to open it! (I'm not complaining--the crate was so well put together, this was the only way to go!) Special thanks to Flo who took my phone order, and was so very helpful. I am looking forward to using the table on my deck as soon as the snow melts!